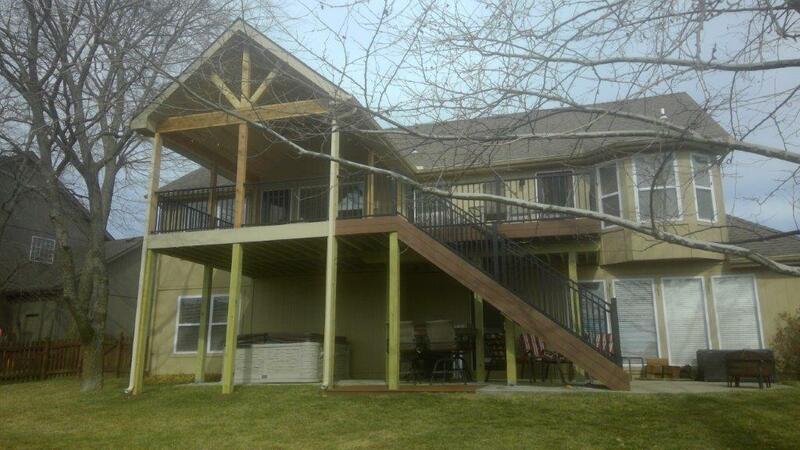 When these Lee’s Summit MO homeowners came to us, they had a small existing second-story deck. They wanted a larger footprint for their outdoor space and they also wanted a covered area for some sun protection. In addition, they wanted to utilize low-maintenance materials to ensure their time would be spent enjoying their new space instead of maintaining it. As you can see above, this new space includes both an open deck area and a covered porch area. With the new design, the footprint for the porch area was pushed out 4 feet to the outer boundary that the setback would allow. This provides a spacious covered area that will easily accommodate generously sized outdoor furniture. The new porch has a gable roof to complement the gable on the existing house. The owners selected cedar for their post columns and for the header. In the design rendering above, you can see that the long stairs empty onto the lower level concrete patio where the family has another outdoor living area including a hot tub. 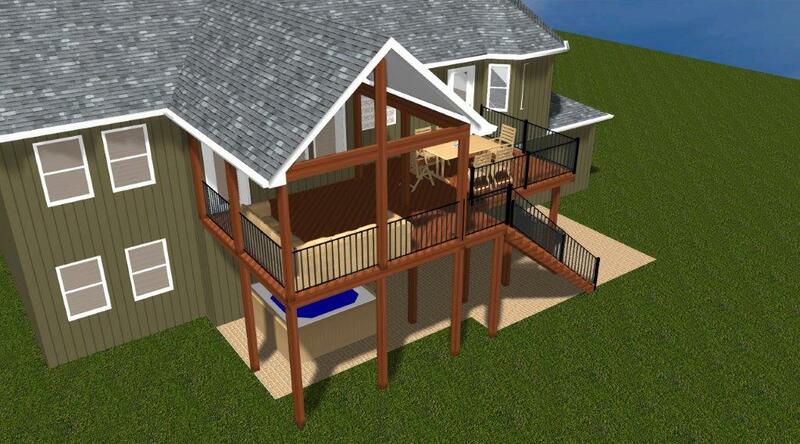 You can see the AZEK Morado deck from this design rendering. The AZEK decking was used uniformly throughout the entire elevated outdoor living space. Square solid-welded Fortress aluminum railing pickets are used in this porch. The pickets are dark-colored and slender drawing the eye out into the yard. Take a look at the excellent visibility into the yard that this railing syle allows. The ceiling is finished with tongue and groove pine. If you are considering updating an existing space or adding a new outdoor living space to your Lee’s Summit area home, give us a call for a free consultation at (913) 851-3325, email us or fill out the form above and we will contact you. 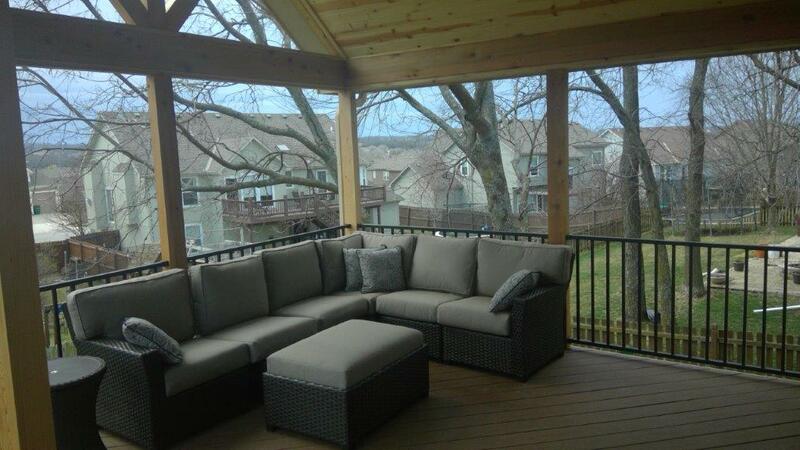 Take a look at more Lee’s Summit outdoor living spaces on our website.